- Sat Apr 13, 2019 8:20 am #532178 I am already aware that China uses Meters and have their own RVSM, as well as Russia using Meters below transition altitudes. However, are there any other countries that use Meters and whether they their RVSM that is similar or not. Especially during a long haul between Europe and Asia. For example, Mongolia - I cross this country a lot before entering/exiting Chinese airspace. Last edited by Brian Fernandez 1438101 on Sat Apr 13, 2019 12:30 pm, edited 1 time in total. - Sat Apr 13, 2019 9:20 am #532179 Basically all countries of the world, except for China and Mongolia, have switched to FEET and the standard RVSM-model. China and Mongolia are the exception. Andreas Fuchs 810809 wrote: Basically all countries of the world, except for China and Mongolia, have switched to FEET and the standard RVSM-model. China and Mongolia are the exception. Russia uses "foot based" Flight Levels and Metres below transition level. This also applies to Kazakhstan, Turkmenistan, Uzbekistan, Kyrgyzstan, Tajikistan, Belarus, Ukraine. Remember though, Transition level is airport dependent though, and tends to be quite low indeed. I think last time I flew to Moscow (admittedly sometime in 2017 or 2018) I got down to Flight Level 060 before being descended to a metric altitude, which - if I remember correctly - was 900 metres. I believe ILS intercept was around 600 metres, and the controller also mentioned that 600m = 2000ft. So all in all, flying to Moscow, I got to use only two metric altitudes, and was told the equivalent in feet anyway, and everything else was Flight Levels. - Mon Apr 15, 2019 10:42 am #532321 If Im not mistaken there are feet in Ukraine. unfortunately that's not all accurate. Some airports in Russia have switched to feet and QNH, even below transition level. One prominent example is St. Petersburg/ULLI. You can easily find out by looking at the AIP/Jeppesen charts, just check for the standard altimeter setting procedure. If it states hPa, then you will be flying feet on QNH below transition level. If it states MM (hPa on req) and next to to it QNH on req (QFE), then the standard procedure is to fly metres QFE. Pyongyan/North Korea also uses feet and hPa. The same goes for Taskent in Turkmenistan. Tajikistan indeed seems to be using metres/QFE, while Uzbekistan has switched to feet/QNH already. Kyrgyzstan has also joined the feet/QNH-club some time ago. Even Belarus has changed to feet/QNH. 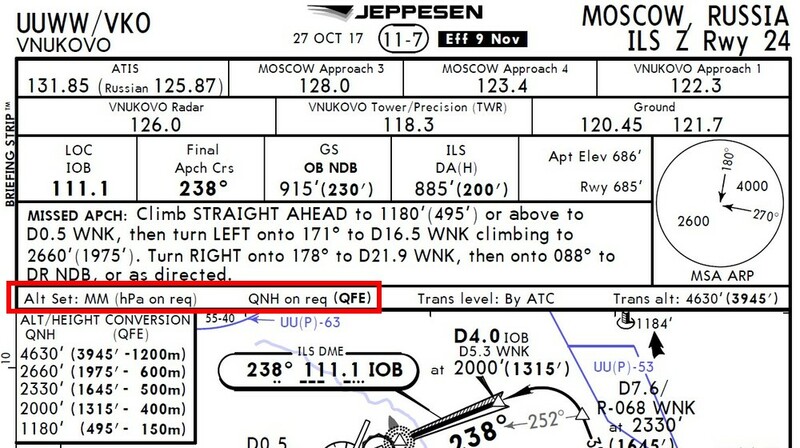 An interesting place is Kazakhstan, because they are officially using metres/QFE, but effectively they are using feet/QNH, at least for us Western operators. The last time I was in Almaty was like 2 years ago, but I am pretty sure that we continued with feet by QNH down to landing. In short: most countries have switched to feet/QNH below TRL, only a few remain. Kiew in Ukraine has been using the same for a long already, too. I had a brief look at UKLL in western Ukraine and they do use feet/QNH as well.